The Hotel Zone encompasses the area of Puerto Vallarta where an abundance of beautiful hotels, resorts and modern high-rise condo buildings are located along the main highway through town, Francisco Medina Ascencio, which runs parallel to the beach. The Hotel Zone extends southward from the Maritime Terminal, across from the Galerias Vallarta Mall and the Walmart Sam’s Club complex, all the way down to the Puerto Vallarta’s large sports stadium, Agustin Flores Contreras which is across from the Sheraton Buganvilias Resort and Convention Center. In the Hotel Zone taxis are plentiful, and it’s easy to hop on a public bus heading south to other areas of Puerto Vallarta such as the world-famous Malecon in the downtown area (Centro), as well as Los Muertos Beach and the gorgeous new pier which are located south of the Rio Cuale in the Romantic Zone (also referred to as “Old Town” or “The South Side”). For traveling by bus to areas north of the Hotel Zone such as Nuevo Vallarta, Bucerias, La Cruz, Punta Mita and Sayulita, it’s easy to get to any of these outlying destinations by catching a bus from the bus stop in front of the Walmart/Sam’s Club complex across from the Maritime Terminal where the cruise ships dock. In the Hotel Zone, from north to south, there are five distinct beaches: Playa de Oro, Playa los Tules, Playa las Glorias, Playa Tranquila, Playa Camarones. These lovely golden beaches of the Puerto Vallarta Hotel Zone are lined with hotels and resorts such as Villa del Palmar, the Hilton Hotel, the Holiday Inn, the Sheraton Buganvilias, the Krystal Vallarta, the Crown Paradise, and many, many more. There are also a wide variety of high-rise condos in this area which can be rented from private parties. Visitors will be happy to discover that within the Hotel Zone there are a wide variety of accommodation choices to suit every budget. Galerias Vallarta Mall Puerto Vallarta, Mexico. Photos are of the exterior of the mall, of Liverpool department store, Chili’s restaurant, a kiddie train that circulates on the second floor of the mall, the food court area, Cinemex movie theater entrance, and a view of the first floor taken from above. The various amenities available in the Hotel Zone are extensive. At the northern end of the Hotel Zone is Puerto Vallarta’s gorgeous, modern, two-story Galerias Vallarta Shopping Mall which is anchored by the Liverpool department store (similar to Macy’s in the U.S.). This large mall has a wide elevator and a parking garage with handicapped parking spaces which make this facility wheelchair friendly. Inside the air-conditioned Galerias Vallarta Shopping Mall there are numerous business and shops such as Lacoste, Hang 10, Levis, Pepe Jeans, Undercolors of Benetton, Swarovski, Spalding, Sanrio Smiles, Quicksilver, GNC, Sally Beauty Supply, Bose, Radio Shack, a Specialized bike shop, and many others. In addition to a few eateries on the lower floor, Chili’s Restaurant is on the upper floor; patrons who are lucky enough to be seated at tables near the window have an excellent view of the Maritime Terminal where the cruise ships come in. The second-floor food court area includes Burger King, McDonald’s, Dominos Pizza, Subway and more. Next to the food court is where the public bathrooms are located. The food court also has floor to ceiling windows on the west side looking out toward the Puerto Vallarta Maritime Terminal; off the food court is an exterior balcony where you can walk out to enjoy a lovely upper-floor view of the area. Additional amenities within the Galerias Vallarta Mall include a Starbucks, Haagen Dazs ice cream, Emotion Casino, a fitness facility, the beautiful and modern Cinemex movie theater where you can see first-run Hollywood movies in English as well as in Spanish (each language is offered at different times) at half the cost of seeing these same movies in the U.S., and an array of other retail businesses. At the Cinemex ticket counter, sign up for a free movie discount card to receive special pricing on movies and other promotions. Sam’s Club is across the street from the Maritime Terminal. Photos of the terminal were taken from the second-floor food court area of the Galerias Vallarta Mall, and show the Pirate Ship and a Carnival Cruise boat docked at the Maritime Terminal. Walmart/Sam’s Club complex which is directly across from the Maritime Terminal and right next to the Galerias Vallarta Mall. Plaza Peninsula is located in the middle of the Hotel Zone in the Peninsula condo complex between the Krystal Hotel and the Holiday Inn. There is a Starbucks here as well banks, a few eateries and some boutique shops. The Consular Agency of Canada is located in this plaza. 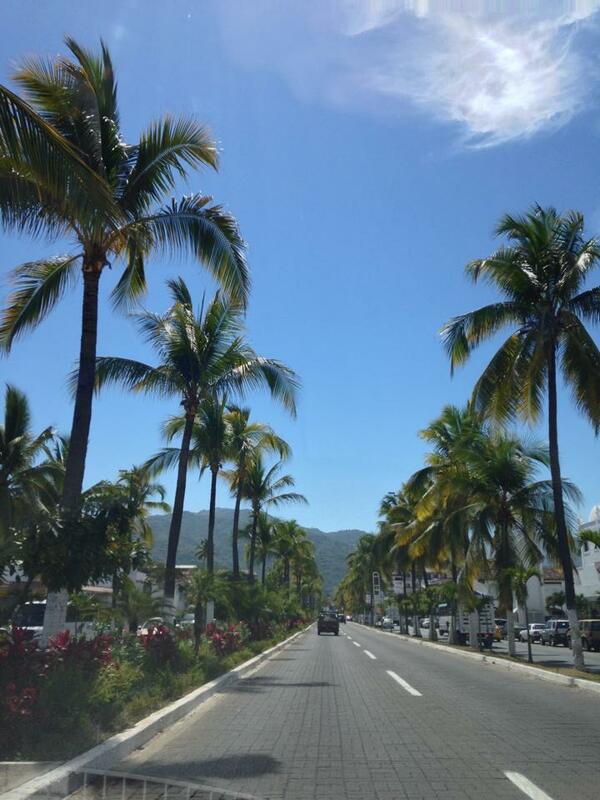 Plaza Caracol is located across from the Friendly Hotel and Villa del Palmar. This plaza’s anchor store is Soriana (a large chain supermarket), Cinemex (state-of-the-art movie theater), Lans department store, Radio Shack, McDonalds, Burger King, Pizza Hut, El Pechugan (excellent rotisserie chicken to go), banks, TelMex (cell phone service provider), as well as an abundance of other businesses, shops and boutiques. 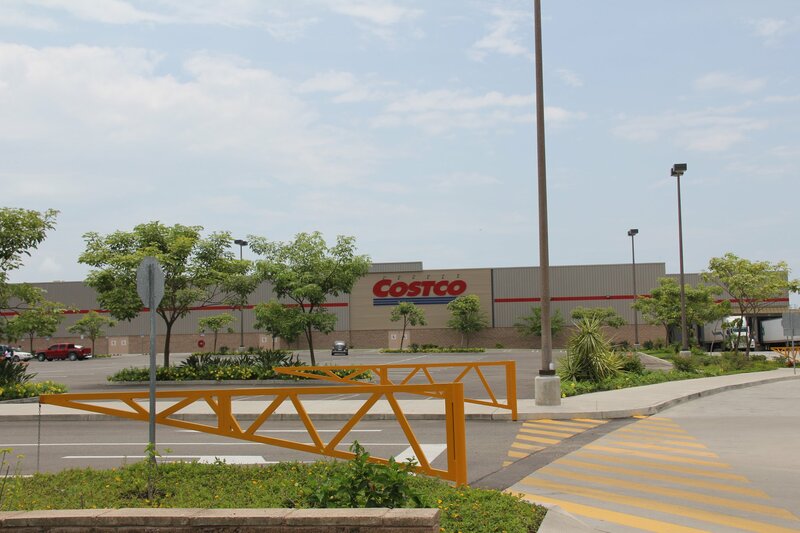 Costco is located just a few blocks south from the backside of Plaza Caracol in the lovely and modern Fluvial neighborhood. The street Fluvial Vallarta is parallel to Medina Ascencio (the Hotel Zone strip). There is a stop light at the corner of Medina Ascencio and Fluvial Vallarta. Look for the tall, modern, silver water feature that marks that corner. Head down Fluvial Vallarta past an intersection with a stop light and you will see the big Costco building on the left-hand side on the corner of Fluvial Vallarta and Francisco Villa. 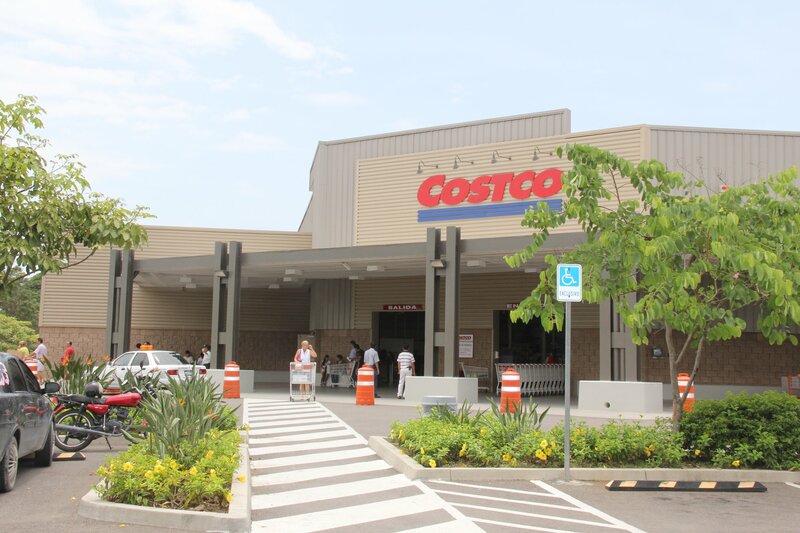 Costco is an excellent place to get flats of water and drinks for your holiday stay, as well as a refreshing iced mocha, mango smoothie, or bubbly drink along with a cheap-eats snack of a hot churro, hot dog or slice of pizza. Plaza Genovesa is just a short distance south of Plaza Caracol along Medina Ascencio, but is located across the street on the beach side of the highway. This plaza is within a residential complex of the same name and includes a small number of shops and businesses to include the office of Mundo Nogalito Eco Adventure Park (tours), Santander Bank, a yoga studio, and an OXXO convenience store.